Have you always wanted to take pictures of nebulae, galaxies, and stars, but you don’t know anything or just a little bit of the topic? Are you thinking about buying your first astrophotography camera or telescope, but don’t know where to start? Or maybe you have some photography equipment, but you are not sure how to use it for astrophotography? No worries. Make yourself a drink (of your choice), sit, and relax. In this astrophotography for beginners guide, I will introduce you to the fantastic world of shooting the stars with a DSLR camera. Astrophotography goal is to photograph astronomical objects – stars, planets, galaxies, nebulae, etc. Photographing from dark places (mountains, villages) is recommended, although it’s possible to do astrophotography even from the highly light-polluted centers of huge cities. The key to amazing astrophotographs is post-processing. All the science signal is hidden in the raw image, revealing it is an art. The easiest deep-sky objects to photograph are Orion Nebula, Andromeda Galaxy, and the Pleiades Star Cluster. Do you already have some photography equipment? Use it! Astrophotography is a genre of photography which goal is to capture astronomical objects on the night sky (well, photographing the Sun can be counted as astrophotography too, but here we will focus on the objects you can see when skies are dark). 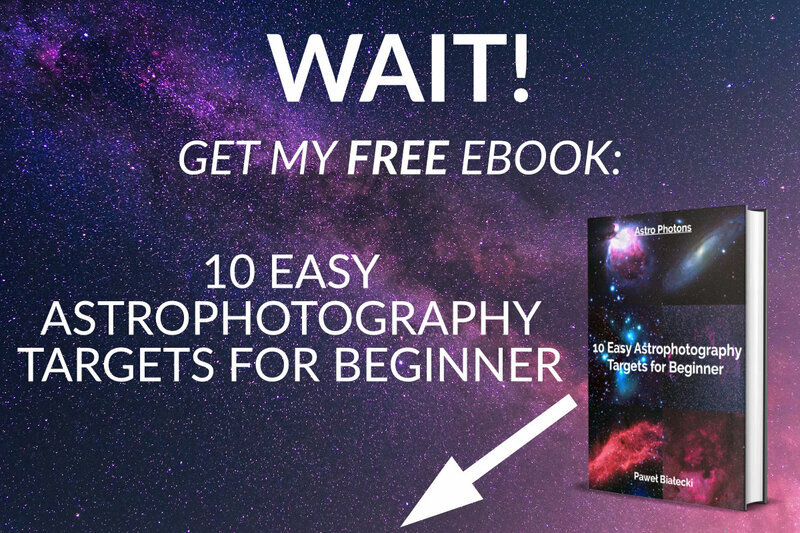 So if your images portray nebulae, galaxies, or stars (this is really easy! ), then you are an astrophotographer! Me under the almost-dark skies in Smedava, Czechia. An astrophotographer self-portrait! Astrophotography has many fathers, but the very first one is the French artist and photographer, Louis-Jacques-Mandé Daguerre. He photographed the Moon in 1840 (!) for the very first time. You can read more about astrophotography history here. Left: the very first photo of the Orion Nebula by Henry Draper, 1880. Middle: my amateur shot of the Orion Nebula. Right: Orion Nebula by Hubble Space Telescope. Source: Wikipedia. Milky Way over Frydlant, Czechia. To capture this photo, I used my Fujifilm X-T20 camera with my 12mm f/2.0 Rokinon/Samyang lens on a stationary tripod (Manfrotto Pixi Evo). It’s the easiest. You just place your astrophotography setup anywhere under the clear sky, and you are ready to go. It requires the least gear – only the camera, lens, and tripod (read more on Milky Way photography gear here). This is the genre where I started my astrophotography adventure, and I recommend every beginner to take this way. It’s not hard, and effects can be awe-inspiring. My very first shot of the Milky Way back in 2017. On that time, I didn’t even have a tripod, so I put my camera on a chair (straight up to the sky) and took this 30-seconds exposure picture. If you have a wide-angle lens (like the Rokinon/Samyang 12mm f/2.0 I used here), you can make a similar shot this night (if there are no clouds and Moon, and the Milky Way is currently visible – it’s not always). Planets are another popular subject among astrophotographers. This category includes the Moon, Mars, Jupiter, Saturn (with its amazing rings), etc. Capturing the Moon is quite easy, smaller planets are a bigger challenge. My current best picture of the Moon. I took it with my Sky-Watcher Evostar 72ED telescope, GSO 2x Barlow lens, Fuji X-T20 camera, Fornax LighTrack II mount, and Orion SkyGlow Imaging Filter. The July 2018 Blood Moon using a 135mm lens (Rokinon/Samyang 135mm f/2.0). This is what I (and MANY others) like the most! Nebulae, galaxies, star clusters, and other objects which are usually not visible to the naked eye – all of them are called Deep-Sky Objects (DSO). DSOs photography is my favorite type of astrophotography, and this blog is focused mainly on them. To be a successful astrophotographer, you have to know a few things about astronomy. When I was younger, I used to think that I have to be an expert, a certified astronomer to produce those stunning images of the deep-sky objects. Boy, so wrong I was. You don’t have to have an astronomy degree, yet to be consistent in your quality astrophotography work, you need to understand a few facts. This may be obvious, but what does it mean for an astrophotographer? Typical day-photographers who are doing street, landscape, macro, or wedding photography make exposures fractions of a second long. In astrophotography, our single exposures are counted in minutes, not seconds. You may not notice this with a naked eye, but in just one minute, stars on the night sky trail. And, if not compensated by a star tracker device (an equatorial mount), those trails will be exposed on your picture (which is not what you want, except when you are doing it intentionally to produce star-trailed astro pictures). Left: properly tracked picture of the Andromeda Galaxy. Right: star tracker turned off, stars trail instead of being stationary in-camera-frame. The Milky Way galactic core (the brightest part of the Milky Way) is best seen during Summer to Autumn (on the Northern Hemisphere). Photographing deep-sky objects during the full Moon is tricky. It’s doable (using specialized narrowband filters, which block most of the spectrum), but it’s best to just wait for a moonless night (or a New Moon). Results will be better (background on the picture will be darker, and faint nebulae details will be more visible). Being able to spot the North Star (Polaris) is probably the most important skill for every astrophotographer out there. Without knowing where the North Star is, you can’t fast and correct set up your equatorial mount (there are advanced techniques to align your mount without seeing Polaris like the drift-align method, but they require more time). Luckily, finding Polaris is quite easy. 1. Find the Big Dipper. 2. Extend the imaginary line. 3. The brightest star there is Polaris. You have found the North Star! It may be taking some time on the beginning, but after a few sessions, you will start seeing Polaris immediately. If you still have trouble finding the North Star, you can always use a mobile planetary app. Astrophotography setup consists of many individual pieces. Every astrophotographer out there have their own preferences and have built their own rig from different parts. Me and my deep-sky imaging rig at my usual shooting place – my balcony. Price. This one is obvious. The deeper your pocket is, the better gear you can acquire. Mobility. Some people build stationary observatories in their backyards and some travel to dark-sky areas with their gear. The latter one will prefer a lighter setup. Quality of the sky in your area. Depending on the amount of light pollution in your photographing spot, you may be forced to use specific cameras (mono CMOS/CCD). So before you actually spend your money on astrophotography gear, find out what are your real needs and goals. My mobile astrophotography setup ready for the night. So, as a complete beginner, you could expect that the first item on the astrophotography gear list will be a telescope or a camera, not some fancy mount (and what is it actually?). Well, a camera, telescope, tripod, and filters are all important part of your imaging train, but the heart and foundation of every astrophotography rig is an equatorial mount. An equatorial mount is a device that compensates Earth rotation. Instead of placing your camera directly on a tripod, you install your equatorial mount on a tripod, and then your camera on the mount. This way, your images will have pinpoint stars instead of star-lines due to the Earth rotating around its own axis. Using equatorial mount, you can expose for ten or twenty minutes (for a single camera exposure! ), and still have your deep-sky object in the camera frame at the exact same position, motionless. It’s impossible to do without the mount. My equatorial mount of choice, the Fornax LighTrack II. I chose it because of the mobility and outstanding quality of tracking. Choosing your first camera for astrophotography is not as simple as it sounds. Although you can produce fantastic results with all major brand cameras, it all comes to personal needs and preferences. My mirrorless camera, the Fujifilm X-T20. Price. DSLR’s are far cheaper than dedicated mono cameras. Built-in LCD screens. It’s fantastic when you can see your picture just after the camera ended making an exposure. And you don’t need a laptop for it. Built-in power sources (batteries). You don’t have to worry about looking for a 12V electricity source (as most cameras and mounts use this voltage). You just buy two or three additional batteries for your camera, and you are ready for the whole night of astrophotography. Ability to use outside astrophotography. Holidays. Family meetings. Your kid events in school. It’s not a deal breaker, rather a nice add-on. Some astrophotographers don’t even plan to upgrade to a dedicated camera. That’s totally OK, as you can produce APOD-quality pictures with DSLRs and MILCs. It’s a matter of preference and skill (in image acquiring and post-processing). You want specifically a DSLR and not a dedicated astronomy camera. The size of the camera doesn’t matter for you (DSLRs are usually bigger and heavier than mirrorless and astro-dedicated cameras). Canons are widely supported by different astrophotography software, so you should not have any problems with drivers, post-processing apps, camera controllers, etc. With Canons, you can use fantastic clip-in filters (H-alpha eg.). You buy one filter (of one size), and you can use it with a variety of lenses. You don’t need a different size of a filter for different lenses. Also, you can modify your Canon by removing the internal IR-cut filter. This way, your camera will become a full-spectrum camera, more sensitive to H-alpha signal than stock cameras from a shop. In 2017, I bought a brand new Fujifilm X-T20 and to this day I still use it as my main (and only) astro imaging camera. Back then, my main goal was to have a small and portable camera, so huge Canon DSLRs were a no-no for me. Back at the time, Sony and Fuji were making the best mirrorless cameras, but Sony suffered from a so-called “star eater” problem. So, Fuji was a clear winner for me. Image straight from the camera, no post-processing at this stage. A dark sky is a true friend of an astrophotographer. Also, as I later discovered (lucky me), the Fuji X-Trans sensor is not equipped with a low-pass filter, which means more H-alpha signal coming to the matrix. It’s a very good thing for photographing high H-alpha emitting regions like the Rosette, California, or North America Nebulae. This is where your wallet may get hurt. As I don’t own a dedicated astronomy camera yet, I will write only what I know from the Internet. So how do they differ from “normal”, day-use cameras? First of all, astronomical CCDs are designed to work only when connected to a computer. They are not stand-alone, they don’t have LCD screens, and they need to be connected via USB to a PC to take a picture. That means you have to carry a laptop with your rig. Also, they are far more pricey. That’s the cons, now the pros. More advanced CCD cameras have built-in sensor cooling, which means a lot less noise in your pictures. Also, with mono CCD cameras (color ones also exist), you can use different filters (like red, green, blue, or narrowband H-Alpha) to produce images in different wavelengths of the visible spectrum (best – like the best of the best on the whole world – astrophotography images are made this way). That, of course, comes with an additional cost (filter wheel). CCD cameras are more expensive, but they give better imaging results than DSLRs. Yet, for a beginner, a DSLR/mirrorless camera is a better choice in my opinion. It’s cheaper, simpler to operate, and gives you more freedom to carry your rig outside your city without additional components (laptop, battery, cables). Also, you can use a DSLR/MILC on typical, daily occasions. And when you reach the limitations of a DSLR, then you can always replace it for a mono CCD in the future. The common misconception is that you have to use a telescope for astrophotography. You don’t! To capture widefield Milky Way shots, you need a widefield photography lens, not a telescope. Different manufacturers have different models in their offer, but the one lens is unbeatable in terms of price-to-quality ratio and it’s available for most mounts camera: the Rokinon/Samyang 12mm f/2.0. My Rokinon/Samyang 12mm f/2.0, one of the best widefield astrophotography lenses. With a fast lens like this, you can capture the Milky Way without using an equatorial mount (although with a one you will get better results), which is fantastic for people on a budget or for people who try to really minimize the weight of their equipment for easy travel. Although it’s best to use an apochromatic refractor telescope to capture nebulae and galaxies, you can do it almost as good with a telephoto lens. The difference will be of course smaller resolution of the final image due to the larger field of view, but the overcome for this is shooting bigger targets (those which don’t entirely fit into the telescope FOV) like nebulae, and go for galaxies later with a telescope. Also, dedicated APO refractor telescopes are usually better corrected for vignetting, coma, and chromatic aberration. Telephoto lenses are not usually designed for astrophotography, so those factors are not the primary ones when producers make their optics. With telescopes, you can (and for deep-sky imaging you should) use field flatteners/correctors. Those devices do exactly what they say – they flatten the field of view and reduce vignetting. Telephoto lenses are also more portable. Less weight, easier to carry the whole setup. Due to the shorter focal length, telephoto lenses are also more forgiving when using with a tracking mount. APO telescopes have longer focal lengths, but this comes with the need to polar align more precisely and generally track the sky better. Getting your setup ready for the ​shooting is faster with a telephoto lens than with a telescope (where you also usually need to setup counterweights and balance your rig). My Rokinon/Samyang 135mm f/2.0 telephoto lens. North America Nebula captured with the 135mm telephoto lens above. It may sound like I advise against getting a telescope, but hell no! The small APO telescope like my Sky-Watcher Evostar 72ED is a fantastic entry point into astrophotography, it’s just a little more challenging at the beginning than a simple telephoto lens. If you can afford it, APO refractor is the way to go. My astrophotography setup with a small APO refractor scope – the Sky-Watcher Evostar 72ED. You have to have a solid tripod for astrophotography. Wind will shake your rig if the tripod is not sturdy enough. Some equatorial mounts come with a dedicated tripod and they are fine. If you are building your rig from the ground up, I recommend buying a tripod that have at least double the carrying capacity than your camera, mount, and lens weight summarized. This way, you will be sure your rig won’t wave. If you are on a budget, you can use a surveyors tripod like this one. Maybe it’s not a fancy looking one, but it definitely does the job right, and the money you save you can spend on a better equatorial mount. For a beginner DSLR astrophotographer, the only filter I recommend is a light pollution filter. A light pollution filter is a must if you live and shoot from a city (even a small one like mine – 20k people). A filter of this type doesn’t block all the light pollution in your area, but it reduces it significantly and is worth buying. For my telescope, I use the Orion SkyGlow Imaging Filter and I’m very happy with it. Another popular option among the astrophotography community is the IDAS LPS filter – I haven’t tested it yet, but other people say it’s also good. Orion SkyGlow Imaging Filter mounted on the William Optics field flattener. Don’t rush to the astronomy store for the new equipment if you already have some DSLR camera with manual shooting mode. Try it first, especially if you have some fast (f/2.8 or faster) lens. You can capture some DSOs on the night sky even on a stationary tripod, especially if the lens is wide enough (8-23/35mm). The standard 50mm portrait lens will be better used on an equatorial tracking mount. Autoguiders are devices that help your mount track better by correcting its imperfections in tracking. They are useful for big telescopes with long focal lengths. For a beginner telescope (400mm-600mm focal length), the good polar alignment is enough to have pinpoint, sharp stars. You don’t need telescope eyepieces if you are building your setup for astrophotography-only, not for the visual observing. You connect your camera directly to the telescope (via the proper adapter) and see the sky on a camera LCD screen or your laptop. Save money for better mount. Planning ahead is essential, as the time is limited, and there are so many targets to photograph! When I was at the beginning of my astrophotography adventure, I used to go and shoot just anything I was able to aim, but the longer I’m in the hobby, the more metho​dical I become. To get most out of your time under the stars, plan your imaging sessions before leaving your home. There are many things to consider. Knowing WHAT you want to photograph is crucial. Different nebulae and galaxies are available during different seasons and at different hours, so planning this ahead is the key to success. You want to do astrophotography from the darkest possible place. That way, not only you will improve your picture’s signal-to-noise ratio, but also your post-processing routine will be much easier. The best way to find a high-quality astronomy and astrophotography night sky in your area is to use the Light Pollution Map web app. Safety is another aspect. Avoid bears. Clouds are your number one enemy, wind is the second. Avoid them if possible. My favorite weather forecast for planning astrophotography sessions is Ventusky. The best astrophotography conditions are when there is a New Moon, and it’s on the other side of the Earth at the moment. You can check the actual Moon state at MoonCalc. Charge and test all your batteries. Check if you have a free memory on your SD card. Refuel gas in your car. Pack some warm clothes in case of a bad weather. Grab some snacks and drinks. It’s better to sacrifice ten minutes for gear inspection before leaving than realizing at the shooting site that you forgot one piece of required equipment and ruining your whole session this night. Photographing in your backyard is a totally different thing than astrophotography outside your home, especially at truly dark-sky spots with no signs of civilization (there is one on my picture actually!) like mountains. OK, but where to point my telescope and what to actually photograph? Those are the common questions new astrophotographers ask. The space is huge, and whenever on the sky you point your setup, there can be countless of stars. Summer Milky Way in Smedava, Czechia. Milky Way at Winter. A mirrorless camera (Fuji X-T20) with a wide-angle lens (Rokinon/Samyang 12mm f/2.0) on a stationary tripod. Wide-field Milky Way shots on a stationary tripod are the easiest way to get into this hobby. As you don’t have to use (although for the best results it’s recommended) an equatorial mount on so short focal lengths, doing this kind of astrophotography is fast, not complicated, and just purely fun. Moon is probably the easiest and most photographed object on the night sky. It’s so bright that you don’t need an equatorial mount to capture it, only a telephoto lens or a small telescope. The Moon eclipse captured with a SMC Takumar 200mm vintage lens. Single exposure, no tracking. By using an equatorial mount, you can capture some deep-sky objects even with a 50mm portrait lens, but to get the best results, a small APO telescope will be the best. All the deep-sky pictures below were taken with my Fuji X-T20 camera, Sky-Watcher Evostar 72ED telescope, and Fornax LighTrack II mount. This setup is a fantastic entry-level choice for beginners. Orion Nebula is a diffuse nebula located in the Orion constellation. It’s so bright that you can see it with your naked eyes (even without a pair of binoculars) looking onto the Orion constellation. It’s the most popular nebula among astrophotographers and you should definitely start your deep-sky imaging from it. It’s available at Winter, so prepare warm clothes when going out to capture it. Andromeda Galaxy is the closest visible galaxy to our own and it’s the most photographed galaxy in the astrophotography community. One of the best targets for beginners, because it’s huge and bright. And last but not least, the most popular star cluster – the Seven Sister, also known as the Pleiades Star Cluster. Again, photographing this target should be one of your first astrophotography challenges. Pleiades are so bright that you can actually see them on your DSLR live screen! The next part of this Beginner Astrophotography Series – Step-by-Step How to Take an Astro-Picture with a DSLR/Mirrorless Camera – is under production. 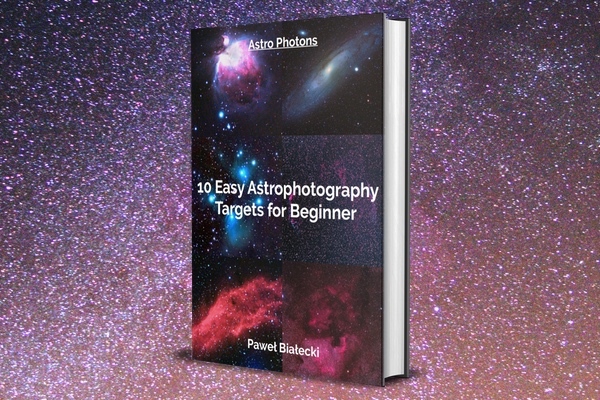 Subscribe to my FREE newsletter to get notified when it’s published and grab a free ebook: 10 Easy Astrophotography Targets for Beginner. No spam ever.